In 1961, a prominent citizen of San Antonio, Florida, offered a variety of old farm equipment to the Pasco County Fair Association. The Association accepted 37 vehicles and tools of yesteryear. This gift provided the incentive for forming the Pioneer Florida Museum Association with 87 Charter Members. The main Museum is housed in a 50' by 100' steel building, which features a wide rustic front porch. Also on the grounds stands the restored Overstreet House, a one-room school house from Lacoochee, a church from Enterprise, the Trilby depot, and a train engine. Moving and restoration were completely paid for by private contributors. The 16 beautiful wooded acres were a gift from a Museum Association Charter Member. The Association has established a Museum that recalls the basic, simple values of our forebears, asserts the dignity of labor, and emphasizes the value of craftsmanship. On display are tools of the Florida Pioneer Man, showing how he built his house, made his furniture, plowed his fields, harvested his crops, and did his leather-work and blacksmithing. Also, the Trilby Depot, the Lacoochee one-room schoolhouse, is a 100-year-old building. Methodist Church from Enterprise and the two-story 1864 restored Overstreet House. On display in the Overstreet House and kitchen addition, are furnishings which reflect the Florida Pioneer Woman's everyday experiences - churning butter, cooking on a wood-burning stove, spinning, weaving, battling and boiling the family wash and doing her household tasks with simple primitive equipment. The Pioneer Florida Museum hopes to show that the men and women who were here before us, struggled, made do, and sometimes won and sometimes lost their battles with nature. In essence, they were people much like us. Blanton Packing House - Citrus Plant that educates school children as well as visitors. A new Blacksmith Shop and Woodworking Shop were added in 2018. 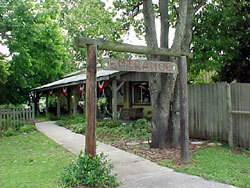 The Pioneer Florida Museum and Village is located in Dade City, Pasco County, Florida.